New York Fashion Week is in full swing! Before the shows began, we tapped the top buyers at some of the most important retail doors to find out which up-and-coming designers they have their eye on—and what it takes to get noticed. Designers to watch: Rosie Assoulin. She is fast collecting fans with her supremely elegant ready-to-wear, and I look forward to seeing what she does next. Other young New York brands that we love include Adam Lippes, with his American sportswear-inspired collections, and Trademark, with their minimalist silhouettes accented with strong colors and offbeat proportions. One brand we are excited to have picked up for resort ’16 is Brock Collection. We’ve been watching them for a while and love their elevated daywear. Outside of the U.S., we are still championing London-based Marques’Almeida—they have really grown their international presence over the past few seasons and extended their design vocabulary to include beautiful brocades. Others to keep your eyes on this season include Vetements, a highly creative collective of designers that have a relaxed, deconstructive aesthetic; Thomas Tait, who’s known for his minimalist, sporty approach to silhouette and cut; and young Irish designer Danielle Romeril—think innovative fabrications, intricate surface embellishments, and directional cuts. What we look for: New and interesting talent that can offer something different to the MATCHESFASHION client, but that also sits within our edit. As a buyer, I have always believed you need to act quickly and follow your gut instinct. But with young designers, you need to consider if they’re ready—for example, with production—so you don’t introduce them too early. Hopes for Spring ’16: Off-beat aristocratic glamour has been a trend, which has mainly come from the Gucci AW15 show, and has continued into Resort SS16. It could be a key trend for the season. Designers to watch: We’ve been excited for the past few seasons about Marques’Almeida and Jacquemus. They both fall in line with the new guard of designers, and they have an edge that new customers are coming to Net-A-Porter for. We also have amazing contemporary brands that don’t necessarily do runway shows that have a strong customer base. We’re seeing many of our customers on the hunt for these brands on a regular basis. What we look for: Our customer is always top of mind, so when we are considering a new brand we look at how it will deepen the breadth of our edit with a new DNA, and also how it will attract a new customer base that contributes to our seasonal edit in an impactful way. We pick up designers who can add something to our brand mix that is not derivative of something we already carry. Advice for new designers: Find your niche and make sure you do it well. I would also say know your own backyard, and by that I mean get successful in the arena you know. Too often designers want to be global, which is hard to do. As you develop your brand, it’s best to grow and build from your own market base. By doing so, it gives you time to iron out the kinks, such as manufacturing and meeting delivery deadlines. 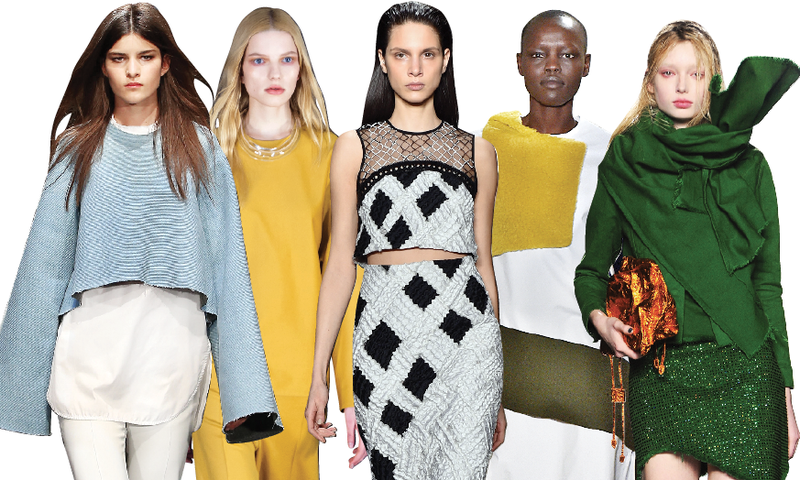 Hopes for Spring ’16: We’re always looking at what is new that will freshen our fashion voice. Our customers are always looking for newness within our edit, especially as they’re seeing everything on the runway six months in advance. Designers to watch: Fivestory’s picks are Rosie Assoulin, Rosetta Getty, Ellery, Alison Lou, Michael Nelson, and Charles Youssef. Alexander Wang will also be exciting as it’s his 10-year anniversary and he’s definitely one to celebrate in style. What we look for: The brand has to have a specific point of view, and that point of view has to be authentic and translatable to the customer. I like my customer to wear her clothes and not the other way around. Advice for new designers: Be persistent each season. Just because a retailer says no one season, it doesn’t mean they won’t be ready for you the next. It also doesn’t mean they didn’t like it. There are a lot of factors in taking on a new brand: budgets, merchandising, etcetera. Our expectations: We like to have the brand garner awareness and excitement. For us it all starts with an emotion; whether that be on social media or in store, we like the mental journey to start the engines. Then usually the sell-throughs follow a close second. Hopes for Spring ’16: I’d love to see designers for both RTW and accessories stray from the super clean and monochromatic—take the boho trend to a more textural, more earthy, maybe even more ethnic level. Designers to watch: Designers Kristopher Brock and Laura Vassar of Brock Collection quietly entered the fashion scene and are developing a focused collection that feels special with a reason for each design. We launched the collection at Barneys this fall and are excited to see how the next collection will unfold. For fall, Spencer Vladimir introduced a beautiful collection of knitwear, which is artful in feeling and artisanal in construction. When the focus is knitwear it’s always interesting to see how the designs transform into the spring season. The energ​y and force behind Hood by Air continues to escalate on the men’s side, and we’re intrigued to see how Shayne Oliver’s vision continues to evolve into women’s. What we look for: Designers who share their point of view and fill a void for Barneys, whether aesthetically or categorically. Advice for new designers: When starting out, designers are often vulnerable to being led astray by the varied feedback they receive from the many sides of the industry. So from the beginning, refining a point of view is crucial, whether it’s defined through design or concept. A brand is built on a capable, consistent, and unique voice. Customers are looking to connect with a brand and to maintain that connection over the long term, so the voice has to be true. Our expectations: Our strategy is to grow our overall business and to reflect the Barneys brand and our take on present-day fashion. We understand that it takes time to build a meaningful business. The expectations for a particular collection are unique to that brand and we work with them to achieve our shared goals. Hopes for Spring ’16: Our customer is looking for a reason to shop, so novelty—whether in RTW, accessories, or shoes—is key. Designers to watch: Mira Mikati, Spinelli Kilcollin, Kit Neale, Marques’Almeida, and Brock Collection. We’ve started carrying—or will be carrying—all these brands, and we bought them because they seemed unlike anything else we buy. What we look for: Brands that have a point of view. We buy some of the best collections in the world, so when we add anything new to our mix, it needs to be special and different. Advice for new designers: New designers should always stay true to their DNA and not try to be all things to all people. Good sales: We love buying new collections and are willing to grow with the brand in the hope that we will sell out of product eventually. Hopes for Spring ’16: We are looking for the unexpected. Designers to watch: Opening Ceremony are huge supporters of emerging designers. We love to be a place of discovery. The brands we carry right now are mostly all emerging talents that we have a strong feeling will be on everyone’s radar soon. Some of the brands to note in particular are Vejas, Wales Bonner, Moses Gauntlett Cheng, and Matthew Dolan. What we look for: I call the formula the perfect storm. I look for newness and an excitement factor, and consider a brand’s commerciality and longevity, coupled with the overall quality. It’s important to have these components present and all done with a clear sense of identity. Advice for new designers: It’s invaluable to have a clear and strong voice, know your market, and have a price-point awareness. Hopes for Spring ’16: I’ll be looking for ’90s grunge dresses in plaids and ditsy prints. Also bright patent shoes and bags. Designers to watch: New York Fashion Week is always abuzz about brands and names new to the calendar. As a CFDA/Vogue Fashion Fund judge, I am particularly partial to the top-10 talents that are participating this year. The Fund is nothing short of famous for launching the careers of many American greats. This season I am paying particularly close attention to the women’s designers showing in the upcoming shows—NM veteran Jonathan Simkhai, Chromat, Baja East, Brother Vellies, and Chris Gelinas’ collection CG, with Thaddeus O’Neil and Cadet premiering women’s collections for the first time. I’m super excited about the premiere of the new DKNY by Public School talents Dao-Yi Chow and Maxwell Osborne. This is a don’t-miss moment in New York! Designers to watch: From their first season, Brock Collection has ticked all the boxes of an MO favorite: Their pieces are effortlessly cool, luxurious, and wearable. This design duo has set out to masterfully update sportswear staples with cleverly conceived, impeccable design and is definitely one to watch. Marco de Vincenzo’s attention to detail and his adornment on refined silhouettes have made his evening pieces highly desirable. And his use of rainbow hues has become a signature, season after season, often in bold, block colors or an embellished trim. Either way, I’m a fan. Jacquemus has been on my watch list since his nominations with LVMH. The sharp lines and fabric patchwork design in his most recent collection provided a refreshing—and welcomed—spin on menswear suiting and modern work wear. Johanna Ortiz is an office favorite. Johanna’s background in swimwear gives her a unique perspective into design. A silk wrap that can double as a cover-up and cocktail dress—is that not what every woman wants when on holiday? As she says it best, her clothes are an invitation to have fun. What we look for: Our customers know that any designer we feature, we believe in. There are a lot of things that we need to consider. Our customers are savvy and sophisticated women, so we need to ask ourselves, Will she flip for it? We always are thinking, Will someone stop her on the street—in a good way!—when she wears that? Beyond that, our clients are looking for great quality, unique design elements, and value—not only cost but wearability. We want to be able to offer something that she cannot find anywhere else and show her something that she wants before she even knows it! Advice for new designers: Quality should never be sacrificed—in materials or design. Our customers are looking for—and appreciate—a luxury product that has impeccable design, craftsmanship, and materials. Good sales: Our designers have a great benefit from the trunk-show model. At the close of the trunk show, we provide direct customer feedback; the designers know what items are resonating with their audience and only produce what has been ordered. This insight is helpful as we build our relationship going forward. Most of our designers see growth when their collection evolves but stays consistent to their design code. Hopes for Spring ’16: Our clients are always looking for newness in the dress category—doesn’t matter the season! This past spring we saw an increase in separates on the runway for both evening and day. Our customers embraced it by buying outfits that fit a wider range of functions.